I had promised a few weeks back to publish this recipe, but work took the better of me, and I never got around to it. Last night I was still in the office late in the evening cleaning up odds and ends that needed to be attended to, and I finally decided to do something about it. I was planning to post the recipe last night, but the pictures were on Normita’s computer instead of on a network drive and I was too lazy to start her machine to move the files. 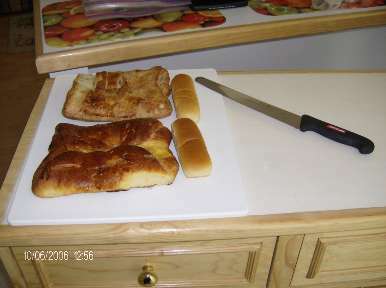 ‘Pouding au Pain’ is a typical French Canadian dessert from my natal QuÃ©bec. 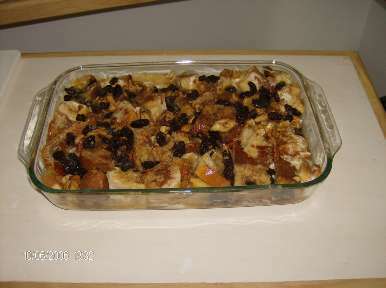 It was originally a recipe made by the poorer classes of society as it is based on stale bread and was usually made with leftover bread to make a cheap dessert that did not use to much fresh products beside some milk and sugar. The version I created here is more upscale and make for a great end to a nice meal. I replace the traditional brown sugar or molasses with maple syrup. Luckily, when I made it the other week when we had invited Normita’s friends over for lunch, I still had a can of nice maple syrup from QuÃ©bec in the cupboard, as it can be difficult to find here in Mexico City. The last time I saw some was a few years back at Costco, and I have not checked recently if they still have it in stock. I am sure that the gourmet section of the major department stores like Liverpool or Palacio de Hierro might have some, but probably at a price I would not want to pay for it. Pouding au Pain is better made with stale bread, and I used a variety of leftover sweet Mexican breads, plus whatever was left in the cupboard that was not fresh. You can freeze your leftover bread like I did, once it is somewhat stale, and use it at a later date. 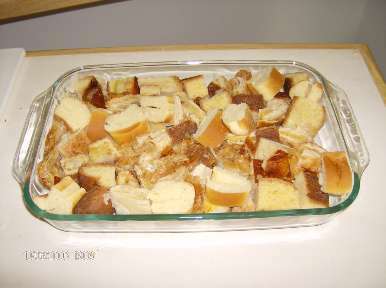 You can use anything from sliced white bread, to leftover hotdog or hamburger buns, to whatever stale bread you have. 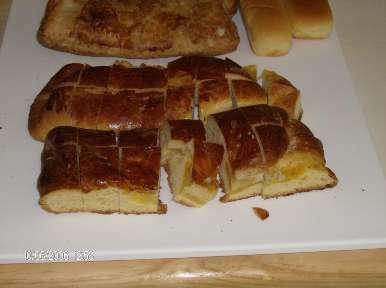 The sweet Mexican breads I used are typically eaten here in the evening as a light supper accompanied by ‘atole’, a flavored drink made and thickened with cornstarch. Our friends like this bread pudding so much that we ended up sending them home with most of the leftovers, so I guess that I will have to make more in the coming weeks as I still have some maple syrup left from the last batch. Yesterday we were entertaining some friends and people were in the mood for tequila. The traditional way of serving it is with some sangrita, a spicy tomato-based drink that is served on the side. Normally you serve a shotglass of tequila, called a caballito, with a second caballito of sangrita. A small plate of limes cut in half and seeded is also normal. I have never seen the locals go through the ritual of putting lime in the fold of their thumbs with a bit of salt and sucking this before drinking the tequila. The only people you normally see doing that are tourists. Most people either drink their tequila straight, or squeeze half a lime in it, and maybe add just a little bit of salt. I also see some people biting into the half lime and sucking the juice, then drinking the tequila, but it rarer than just squeezing lime juice in it. I used to prefer my tequila, normally a decent ‘reposado’, meaning rested, a tequila that is aged. or rested, in wooden tanks for at least 2 months up to about a year. Those tequilas lose their white color and take a nice golden hue, and they are normally much smoother to drink than white tequila. If they are aged longer than a year, they can then be called ‘añejo’, the smoothest of the tequilas that I normally prefer as an after dinner drink. I recently tried a few times my tequila on the rocks in a scotch glass with the juice of a lime in it and find it both very refreshing and very smooth going down. I like it a lot like that when I am in the mood for it. Today I started on something that was long overdue. I moved the various recipes posted in the blog to some generic high level categories as I was somewhat losing track of if I posted this or that recipe in the past. This is only a start to facilitate navigations, and I will probably refine the sub-categories in the future, and also add another level or two in the hierarchy. The basic WordPress software can display the hierarchy of the categories pretty well, but things get a bit cluttered when you start to have too many nested categories. I will look around to see if the newer version of WordPress is better at handling this out of the box, and if is I might decide to upgrade the version I am running for the blog. This will have to wait though as I do not want to take a chance in ruining the blog, so I will need to setup an internal test site first and I will not have time to do that until some urgent work around the office is done. I will also look around to see if there is some plugin available that makes navigating the categories smoother, and if not it might be worth writing one in my spare time. It seems that in the last month we went to more restaurants than we have been in the last 3 years. As mentioned yesterday we went to eat some goat with the in-laws at a restaurant about 20 minutes from home, when there is not traffic. 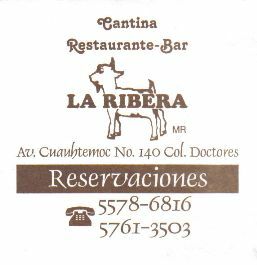 The place is called ‘La Ribera’ and it is located in the Colonia Doctores, on Avenida Cuauhtemoc. It has a reputation of being the best place in town for goat, and I have a feeling that the reputation is somewhat overrated, but since I have not had any other goat in town I have no real way to corroborate this. 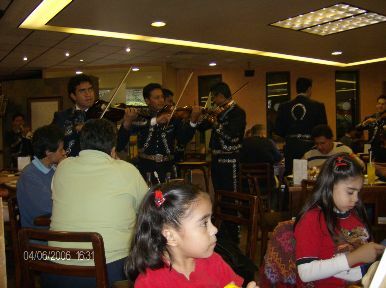 The place is a nice large dining room and has the typical atmosphere of these kinds of places in Mexico, which means it is full of activity and noisy. 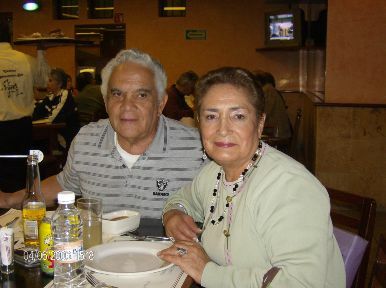 Only part of the family showed up as Normita’s older brother could not make it as he was out of town. 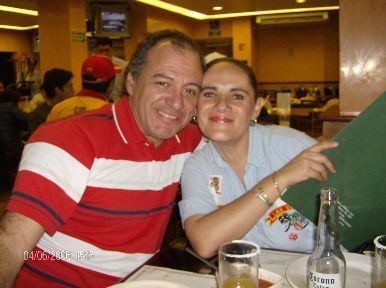 Both her parents were there and Normita’s younger sister, Marce, with her new husband and her two young kids. There is a varied menu of typical Mexican dishes, but the baby goat (cabrito) is the house’s specialty. 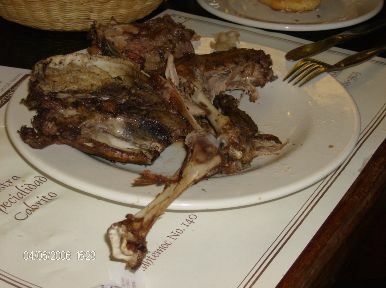 Since this was the reason to be there, everybody had the cabrito, and most people opted for the leg (pierna), which would be the lower leg, but the lower leg bone was bare and the meaty part was actually the thigh, so I’m not sure why they called it like that. The place was somewhat busy and there was a huge number of waiting staff, but despite that the service was slow and uneven. We waited a lot for the different course, and yet again at the end of the meal for the bill. The main course of goat comes with a bowl of shrimp broth as starters. The broth was flavorful, with a strong shrimp taste as it was made with dried shrimps. The consensus of the table was that it was too spicy, and I agree with that. I am not crazy about dried shrimps, as they can be overpowering, and they are so much a pain to eat that I preferred to leave them in the bowl and just eat the broth. It was a bit overpowering as the only thing that we had to drink at the time was tequila, as they took about half an hour to bring us the mineral water we had ordered. The cabrito was accompanied with a small dish of grilled onions and jalapeños, and a small dish of guacamole per two people, and was simply a plate with the small leg, a chunk of shoulder, and half a baby goat’s head for the brain and tongue. There was no side dish to be had, but at least for me the leg was very juicy and tender. The guacamole was simply crushed unseasoned avocado, thus really not guacamole, and some of the batches we had were probably leftovers from the day before as it tasted stale. There was some ‘salsa roja’ that was served with the bread, but it was very liquid and flavorless. The plates were accompanied by small corn and flour tortillas to make tacos, but without any decent condiment to put in them they were really bland. My plate was luckily very nice and moist, but the meat was disapointingly devoid of any taste and seasoning. Normita’s was dry and not as tender, but she mentioned that there was a hint of garlic taste to the meat, which would have been welcome to mine. While we were in the middle of the meal a decent Mariachi band started playing, but in a crowded busy room the noise level was deafening. Luckily they were good, but I ended up with a bad headache soon after they started. Even the kids thought it was too loud, so you can appreciate the noise level. After the Mariachis finished their show, as we were leaving, there was a magic show for the kids that was starting at a little stage by the entrance. Overall the place is typically Mexican in both atmosphere and food, but we found the food overpriced, and the drinks definitely so. The service was uneven and very slow. The goat, that was supposed to be their specialty, was disappointing and boringly served with no side dish, and I would only recommend this restaurant for people visiting town who want to have an idea of what a typical local restaurant can be, but that in itself is not a recommendation. On Sunday afternoons the place is booming with local families on their weekly restaurant meal, and during the week I hear that there are a lot of regulars going there to play dominos. For people who want to eat goat I will try to find a better place, and also to try to find a better restaurant of that type to recommend, as I cannot give it a recommendation. I have been asked a lot in the past about what to do with leftovers. I always try to use all the food that we buy as I do not like throwing things away and wasting them. Yesterday was our usual shopping-for-the-week day and we bought some stunning fresh chucked oysters in their juice, and some nice small cooked shrimps that were unbelievably tender and sweet. That fish merchant that we discovered at the Jamaica market last month really has some stunning fresh fish and seafood, and at a very low rice as the shrimps and oysters came up to a total of around $6. For supper last night Normita prepared her world famous shrimp and oyster cocktail and I have to confess that we did throw out the nice oyster juice, as it does not really keep and we were not planning to cook anything else within the day, as today we are going out for lunch with the in-laws for an early father’s day and mother in law’s birthday celebration, as they will be out of town on a trip during both occasions. The family will meet at a restaurant that specializes in roasted goat, I think, and I will be sure to let you know how it turns out. Going back to my story, I was in the mood for a nice fresh baguette to go with the shrimp cocktails, and we were doing our rounds of shopping and I realized that we did not pick up any bread when we passed by the supermarket. Since we both were dead tired, and did not feel like making another stop on our way back home, I looked for some baguettes in the store we were at the moment, and the only thing they had was packages of 3 freshly baked baguettes. It was a tad more than even I can eat in one sitting, but I was dead set in having my baguette. I assured Normita that I would find something to do with the leftover bread and we took it back home with us. 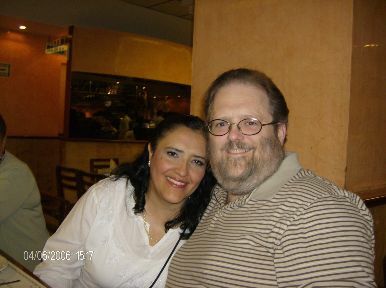 Last night we were discussing that Normita would invite some of her friends for supper next Saturday night, and I was starting to plan the meal ahead. The last few months have been totally crazy and I have not had the chance to spend as much time in the kitchen as I normally do, and I am looking forward to plan a decent meal. Time will be tight, as we will both be busy at work all week, and Friday night the cleaning people are coming to clean up the place, and they normally leave around 9pm, thus not leaving me with much room to prepare things ahead of time, and I do not want to spend all of my day in the kitchen on Saturday, especially since we will have to go pickup some fresh ingredients at the market early Saturday morning. As a first course I will do my Vichyssoise, as I still have not had time to do it since I posted the recipe the other week, and I still have a nice craving for it. I can easily prepare that after the cleaners leave of Friday night. I settled for preparing my shrimps with chile guajillo as the main dish, as the fish merchant always has some stunning juicy ones, and it is a very quick and easy plate to prepare, as the only time consuming part is removing the heads and shelling the shrimps. I have still to settle the side dish for that main course but I have all week to think about it. I also though of a quick an easy way to accompany the meal, and at the same time take care of the leftover baguette. I decided to prepare some nice garlic bread this morning and to freeze it, and then I will only have to broil it before serving next week, as is or with some nice grated cheese on top. We had also picked up some nice sweat Mexican bread for breakfast today, and we shared one piece, and we were both stuffed. I still have two pieces leftover, and they are too heavy for my regular weekday breakfast. 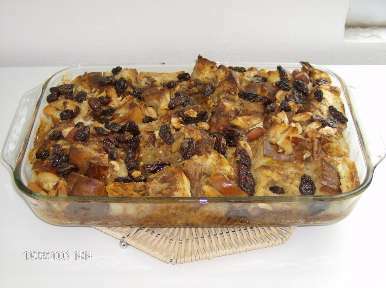 I decided to salvage them again by preparing a typical dessert from my native QuÃ©bec, some ‘pouding au pain au sirop d’Ã©rable’, a bread pudding made with stale bread and maple syrup. I will post the recipe later in the week once I actually prepare it. For now I will let the bread go stale for a few days, and then freeze it until I decide to prepare the pudding, probably Saturday afternoon. Enjoy these simple leftover recipes, and I will make sure to post more whenever I prepare some. 1. Chop the garlic finely and but in a bowl. 2. Add the softened butter or margarine, the parsley, the basil, and the salt and mix thoroughly with a fork. 3. Cut the baguettes in half lengthwise, and then again in half in the thickness. 4. Cut the split baguettes in 3" pieces and spread a generous amount of the butter mixture in them. 5. If you plan to eat them right away, place on cookie sheet and sprinkle with some grated cheese if you want it. 6. Place in a hot over under the broiler until the bread is golden, or until the cheese is melted if you prefer the bread with cheese. 7. If you plan to freeze it, place the separated pieces of bread back together without any cheese, buttered side against butter side, and place them in zip-closure bags. Put in the freezer and they will keep for about a month if well sealed. Thaw and broil as above with or without the cheese.